Center height - 4' 10"
Minimum weight - 7 lbs. 13 oz. Floor size - 8' 7" x 7' 2"
Backpacking tents need to be exceptionally light, compact and durable. This Timberline Four Adventure Backpacking Tent meets those requirements, then some. Ideal for casual backpackers, this is a three season tent good for spring, summer or fall. The frame is half inch lightweight aluminum. The eaves are shock corded for stability and wind resistance. The fly is hooded to allow ventilation during rainy weather. The tent will sleep four campers. 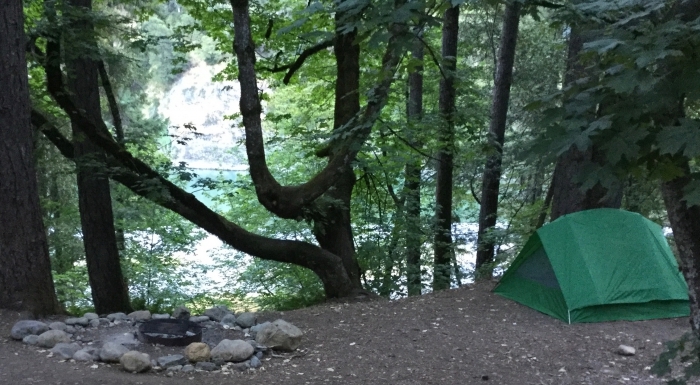 Eureka Camping makes the Timberline Four Adventure Backpacking Tent. How big is the rear window? I have a Timberline 4 from the early 1980's (its Orange) and the rear window is rather small... maybe 18"-24" tall. I was thinking about getting a replacement, if the rear window is much bigger. I cant find a picture of the window on any web sites. The rear window on this item is 3 foot high and is 4 foot wide at the bottom. The rear window is almost full width. It goes from the very top to about 8 inches up from the bottom. It is very similar to the front window. Does the minimum weight include the poles, required connector parts and stuff sack? The actual total weight is 8 pounds. Can you zip close the door and the back window? Yes, you can zip them closed. However, they are made of a mesh material so you would need to be sure to keep the rain fly in place to protect the inside of the tent from water in the event of rain. Yes, the tent zipper will completely close the door/windows. The tent has very good zippers. We have been using this model for twenty years successful with Boy Scout Troop. Eureka has parts available, including zipper repair/replacements. Good investment for solid, 4 season tent that will withstand difficult weather and handling, but is not a typical backpack tent today due to the weight. Short answer: yes. The back window has insect netting that is always closed, but the actual tent wall zips up on each side, allowing ventilation if fully open and none if fully closed. As for the door, there is a zipper on one side and the bottom that opens (and closes) fully. The door consists of insect netting and (effectively) a window that works just like the back window. Yes the back window has zippers, opens approximately 1/3rd of the height of the tent. Enough of an opening for ventilation and to still have privacy . Great- double the size of what we have historically used! We have been using a Timberline 2 since 97. Had to get a bigger one to accommodate for 2 more. It's perfect for our needs. Our Timberline 4 has served us well for over 35 years of mostly car camping. Only recently has there been signs of wear, namely the tie-down loops on one side of the rain fly. I attribute this to many years of UV sunlight exposure. I have tried to reinforce this loop in the field using a strong duct tape, and it has held so far. I imagine a replacement fly might be available. I have had to replace the bungee cord fly and peak loops once, a few years ago (available from Eureka.) I have seam-sealed the floor seam every few years. And I had to sew a patch on the front screen where I ripped a hole (my fault). A quite comfortable tent for two adults. I would not want to squeeze in much more. We use a queen air mattress, which takes up most all the floor space. When this tent finally goes to its final resting place, I will be hard pressed to find a decent replacement, unless I go with another Timberline 4. Really, though, I need more headroom than the 4' currently offered, because I am 35 years older than when I first bought this tent. A good, solid, workhorse of a tent, it has been a great friend for years and years of service. ProsQuick set up (leisurely 10 minutes). Relatively light weight. Durable. Good ventilation. Replacement parts readily available, if needed. Always easily repacks into its stuff sack. Comfy space for 2 adults. ConsA bit crowded for 3 adults. Low headroom. We have been camping in our Eureka Timberline 4 for 35 years. It is just the right size for two adults and perhaps a child. We have camped in it so much that we have replaced the fly 2 times, and the shock cords once. It has served us very well except for one thing. We have had a lot of trouble with the zipper for the entrance. It gets caught in the flap & then gets broken. The zipper has been replaced twice. But overall, this has been a very good tent. I would definitely recommend this tent for car camping. ProsIt is excellent for keeping dry in rainy weather. The fly is perfect for that. It is very easy to set up and take down. ConsThe zipper has been our main problem. It gets caught in the flap & breaks because of that. You have to be very careful when using the zipper. I have owned two of these tents. My first tent was a two person tent. I passed it along to my son when it was 20 years old and had been used in all types of weather and terrain. It was still like new! I had purchased a four person tent while our sons were younger. We used it for about twenty years also. It's never had any damage or wear until I loaned it to a neighbor. They left food inside and a mouse found its way inside. I patched it and sealed the seam and that was all it's ever needed. Now I camp in the motor home, but still treasure memories of our adventures in our Eureka Timberlines. You can't go wrong with Eureka Timberline! I bought 6 of these tents for our Boy Scout Troop. For the price, they are a great tent to learn to camp. They set up easy and can endure a lot from the boys. These tents have been around for years and parts can easily be found for them. When our scout troop needed a durable and rugged, light weight tent for camping. We looked at various manufactures and Eureka Tents were the best for our needs. These tents lasted between 4-5 yrs ( used every six weeks in all FOUR SEASONS). Quick and easy to set up even in a storm. The tents can be used on all terrains and some even on a small grade of the land. Vestibules are extra and well worth the cost, not only can you store your gear but added more protection from a storm for both doorways, thus four people can be very comfortable. Dries quickly, never had any mold or mildew on them. Can be setup by one person, tent pegs go easily into the ground but hold securely. ProsFloor built into the tent and do not need a plastic ground cover ( but recommend ), thus no water running thru the tent, keeps out creepy crawlers that come out at night you are totally encapsulated. No mold or mildew, quick drying and can be used with or without the fly low maintenance. One person setup, replacement parts are interchangeable and easy to re-order from the manufacture. ConsNeed to re waterproof the stitching, otherwise you can have water leakage, plus reduces breakdown of the stitching material. Most tents need this maintenance. Staining can happen from the tent environment . Have used this tent for many years. It stands up under harsh weather conditions including heavy snow loads. Easy to set up in the dark, rain, and snow. ConsThe weak spot is the zippers, have to be careful not to break them especially with younger Scouts. The tent leaks. I purchased 4 tents for scouts because the timberline had a good reputation. Used them for a week long summer camp. One of the scouts mentioned that he had water in his tent. I did not believe him so after the camp set two of the four tents up and tested them with a hose. His did leak and so did the other ones, but not as bad. Pulled out and old timberline 4 to see what changed, vintage unknown but has no plastic clips. The difference is that the rain fly extends so the water coming off the rain fly does not land on the corner seams of the main tent. where the new ones seems to channel the water flow on to the seams. I applied a seam sealant which I assume will take care of the problem. Do not know how often I will need to redo. Also had a cord in one of the ridge poles failed, eureka replaced it. Shopped the usual suspects on the internet for price and reports of vender service Our family has used Eureka tents for over fifty years and found them well made and durable. eCanopy delivered on price and rapid shipping. I first used the Timberline 4 in the 90s. I think it is still the better deal in comparison to newer designs. The tent is lightweight yet durable. It doesnt take up too much space when packed. Yet, when set up, it has enough room for two or three adults to move around in. Although this tent doesnt have as many mesh panels like the newer tents, you can keep air circulating by opening the vents. Not having mesh siding is beneficial during harsh weather. You dont have to worry about bugs, sand, snow, or rain coming in through the mesh. This tent will stay put if you are careful to secure it to the ground. Tie down the top part of the tent with four lengths of parachute cord or rope. Use the guy-out points at the top corners, for windy conditions. This tent is a great tent to use all year round! I basically lived in this tent for a couple of summers. It withstood Oregon's wet weather. While camping in Montana's Glacier National Park, it was the only tent left standing after a major storm with high winds. I love this tent. It's also very easy to setup. I highly suggest buying this A frame. My wife and I bicycled 18 months through England and Europe back in 1979 and 1980 with an earlier version of this tent where she carried the tent and I carried the rain fly, poles and stakes. Yes, it's not the best in wind, but for the money it's a good value for a spacious tent that's reasonably light weight and easy to set up. This is our 3rd Timberline and it still goes up and down in the same old reliable way and is still easy on the eye and wallet. ProsGood value. Easy to set up. Spacious. Reliable. Reasonably light weight. ConsNot good in high winds. Great design. Light and portable. Easy, fast one person set up. Roomy inside. Slept two adults and a gear pack with room to spare. ConsPrice seems high but if the tent lasts it is well worth it. I am a director at a Bible Camp and these have been the best tents for us ever. I was thrilled to find the pricing that we did through ECanopy. The tent is perfect. Back in the early '80's I had the 2 person TL and loved it. In the 90's I pulled it out of storage and simply tossed it out due to my poor judgement in storage care. It smelled something awful! Enter 2014. The tent is HUGE compared to my previous 2 man TL. Essentially it is the same but enlarged with upgrades and refinements. Perfect for my less than perfect flexibility. I feel at home in this tent, just like I did with younger flesh and bone. I have been very pleased with my purchase of this tent. Ive used this tent multiple times on various long camping trips in rough, unpredictable weather. The tent has continued to provide shelter regardless of the outdoor conditions. Once I find a good price for it, I am planning on purchasing another. My wife and I fit comfortably inside the tent, but I do not think that four people would. The A-frame does not allow for as much space as the dome shaped tent does. Furthermore, the vestibule is not very wide; anything that needs to be protected from the weather must be kept inside the tent. Again, that would be an issue with four people in the tent. I have been using these tents in a commercial setting for many years with kids on trail. These are the most durable and easy to set up tents I have used. Other tents may be lighter but they are more complicated to set up and have more fragile pieces that can't take the use of multiple kids over multiple summers. I would highly recommend this tent for any groups running multiple trips with school-age campers. ProsEasy to set up, durable, roomy (easily can fit 4 middle school campers inside), Overall a workhorse of a tent. ConsHeavy, not the lightest of tents to use for backpacking. They also are a little on the large side which may be a challenge for small campsites. I have been using these tents in a commercial setting for many years with kids on trail. These are the most durable and easy to set up tents I have used. Other tents may be lighter but they are more complicated to set up and have more fragile pieces that can't take the use of multiple kids over multiple summers. I would highly recommend this tent for any groups running multiple trips with school age campers. We have used our Timberline 4 for 41 years and several others from Boy Scouts, friends and acquaintances. With proper care we expect our 41 year old to continue to serve well. So how do we care for it to keep it healthy? 1. Dry before packing each day. If it is wet after a too quick getaway, don't let it stay wet. 2. Stake it down. Keep different stakes for soil, sand and rocks. Prepare tie down bags for the corners if you cannot get a good hold into the land below. 3. Don't loose the plastic pole connectors. Color tape helps identify each pair per tent. 4. Practice setting up the tent solo in the dark when it doesn't matter. When you are consistently under 4 minutes setup then ready to go camping. Use 2 people in wind. 5. As a backpacker tent, divide the fly, poles, main, stakes among the hikers. 6. Re-apply waterproof from time to time before needed. 7. Don't cook inside, but eating is okay. 8. Use a ground cloth underneath and sleeping pad inside. I like it best when car camping for 2. Ours has camped on each coastline and back country from Yellowstone to the bottom of Grand Canyon. Enjoy. We have used our Timberline 4 for 41 years and several others from Boy Scouts, friends and acquaintances. With proper care we expect our 41 year old to continue to serve well. So how do we care for it to keep it healthy? 1. Dry before packing each day. If it is wet after a too quick getaway, don't let it stay wet. 2. Stake it down. Keep different stakes for soil, sand and rocks. Prepare tie down bags for the corners if you cannot get a good hold into the land below. 3. Don't loose the plastic pole connectors. Color tape helps identify each pair per tent. 4. Practice setting up the tent solo in the dark when it doesn't matter. When you are consistently under 4 minutes setup then ready to go camping. Use 2 people in wind. 5. As a backpacker tent, divide the fly, poles, main, stakes among the hikers. 6. Re-apply waterproof from time to time before needed. 7. Don't cook inside, but eating is ok. 8. Use a ground cloth underneath and sleeping pad inside. I really, really like my Eureka Timberline 4 tent. I would recommend it to both first time campers and experienced campers. It has proven its worth over and over. I have taken it on numerous, various outdoor activities, and it has continued to serve me well. This tent truly is incredibly durable. It can survive through moody and even extreme weather. The tent has never let me down even in windy conditions. Setting up this tent does not take long at all. You will grow faster at setting it up every time. You can also leave it free standing without the. The tent provides a large vestibule and great ventilation. Staying 100% dry in this tent takes a bit of work. You must set up the fly tightly to keep the tent waterproof. Rain can seep in or near the door. For the most part, the tent has kept me dry. It does not compress well or carry lightly, but other than that this tent works great! If you are replacing an older model of this same tent, you may be disappointed. I would rate this one with only three stars compared to my five-star 1980 model. The design is standard for these tents. It will only fit four people they are small and if supplies are stored somewhere else. We have been buying these tents for a number of years for our Boy Scout Troop to use. Some changes have been great like the stronger plastic tent pole attachment piece that didnt break in the cold like older models did. A change that was not good is the heavier shock cord. There are ten of these for each tent and I have had to change them all when the rubber broke inside the material. We carefully checked that the scouts were being careful, but concluded that the rubber material broke down when it happened to the Scoutmaster, too! You can order replacement cord, fasteners and even the right kind of pliers from marine suppliers. I cant give this tent a high rating like my old one. The Eureka Timberline 4 tent closely resembles the Black Diamond Free Spirit, which is no longer being produced. I believe the material used in the Timberline is basically the same as that which was used in the Free Spirit. The Timberline has a reasonable weight-to-size ratio. However, this tent is purpose built and not made for an ultra-lite backpacker or long hikes. I think this tent is perfect for long weekend mountain camping or canoe trips. It will last long if it is taken care of well. My one complaint is that the elastic cord stretched out too easily. I am incredibly pleased with this tent. Although it was a bit pricey, I found that the good quality of the tent more than compensated for the price. My scout troop has gone to these tenst exclusively. They are fairly light weight, hardy and easy to set up by even the yourgest of scouts with just a little instruction. I needed a tent for the week-long great Ohio Bicycle Adventure that would be quick to put together as well as take apart and store. I had no problems with assembling this tent, even when I had to do it in a downpour. With all your gear, this tent would fit no more than two people. It also isnt tall enough to stand straight up, but was roomy enough that getting dressed wasnt a problem. In the morning, just disassemble and put everything back in the storage bag. I had a problem with rain coming in through the bottom zipper but fixed it by putting something up against the front threshold that would keep it tight. As with most tents, the bottom zipper can get jammed easily from the flap. I followed the directions about using ropes over the top when it was very windy. It worked well in all weather! Bought one of these tents 15 years ago--I've been very happy with it. It still works great. Bought a second one just a couple years ago--very disappointed at its poor quality. Shock cords are already shot--frayed and ruined--on the new tent. Shock cords on the 15-year-old tent are still fine. I have a four man tent even though just my wife and I use it. We like the extra room and think that a tent for two would restrict our movement too much. Although it can be set up by just one person, it goes so much more smoothly when two experienced people do it. Anchoring it well is important to make sure it will be stable. You may want to add two extra stakes and cord to really hold it in place. Although the stakes that are included work, I plan to replace them with up-to-date titanium stakes as needed. It rained the first time we used it and we had no leaks. The seams are taped, but it is still important to spray seam sealer from the start. You will want to use a tarp under the tent also. Although I have not had problems, I was concerned about the seam right down the center of the floor and sealed it. Two large windows allow plenty of ventilation. This tent should last for many years if it is taken care of. I really like my Eureka Timberline 4 tent. I would recommend it to both first time campers and experienced campers. It has proven its worth over and over. I have taken it on numerous, various outdoor activities, and it has continued to serve me well. This tent truly is incredibly durable. It can survive through moody and even extreme weather. The tent has never let me down even in windy conditions. Setting up this tent does not take long at all. You will grow faster at setting it up every time. You can also leave it free standing without the. The tent provides a large vestibule and great ventilation. Staying 100% dry in this tent takes a bit of work. You must set up the fly tightly to keep the tent waterproof. Rain can seep in or near the door. For the most part, the tent has kept me dry. 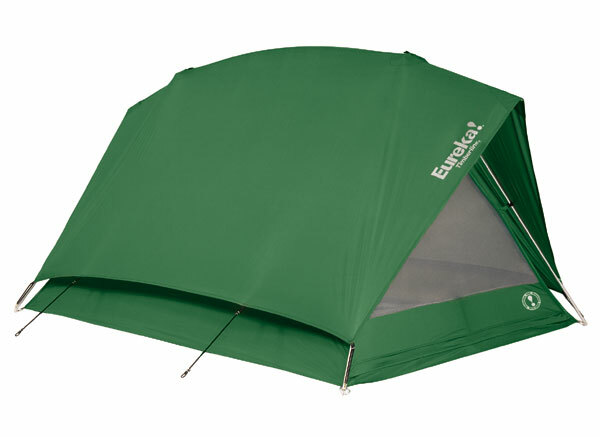 It does not compress well or carry lightly, but other than that this tent works great! During the 1980's my family made the decision to buy a set of five tents. They do look quite nice and are quite easy to use. Sadly, when a storm hits, these tents are goners. They were pretty badly mangled, and the poles sustained damage that essentially marred them for good. Domed tents are cheaper than this tent design, and they also will do much better in a windstorm.